Throughout my career, I’ve had the opportunity to launch innovative new products not only as an entrepreneur at my own startups like Anywhere.FM and Connected, but also as an intrapreneur at Microsoft and LinkedIn, bringing brand new products to market at these established tech firms. Every established tech firm aspires to bring the innovation culture that’s so native to startups to their own organization, but often struggles to do so. I wanted to share my perspective on what causes this inertia to innovation at scale and how to overcome it. High expectations on opportunity size from day one. Large tech firms got large because of how incredibly successful they have been in their core and associated businesses. These business often continue to grow at a fast pace. The challenge this creates is that as new opportunities are evaluated, they are often compared to the scale of the core businesses the firm is already in. And new innovative opportunities that go after new or nascent markets often fall below the bar of interesting for such firms as continuing to innovate at their core often looks like larger opportunities. Similarly when they do pursue new innovation, they often expect a quick ramp to bring the business to scale like their core business and often become bearish on such projects when they don’t immediately see similar results. High cost associated with socializing ideas & driving consensus amongst key stakeholders. Unlike an early-stage startup where most of the critical decisions often fall to the founders, at an organization at scale there are a variety of key stakeholders that must be bought off on new ideas, including executive leadership as well as key partner teams whose resources are needed to bring the innovation to market. This socialization can often come at the cost of speed of decision-making, making it difficult to match the speed of a startup. Infrequent challenges to the core assumptions driving the business. Large organizations often have core assumptions that drive their business that were historically made but rarely challenged. When you ask folks why core assumptions were made you might find that they tell you because it’s what’s always worked for them, which becomes dangerous since not challenging these assumptions is what often makes it difficult to innovate. Most startups are often challenging the core assumptions of incumbents and building their entire business around such new points of views. Difficulty in recreating the sense of urgency inherent in startup environments. What often drives a core sense of urgency in startup environments is the realization that the startup may run out of cash, not reach product/market fit, and in general fail to exist even 6 months from now. With these realization founders and startup team members alike often feel compelled to urgently make progress to avoid the ultimate death scenario. At large organizations this fear rarely exists since innovative projects are often funded by the mature core businesses that made the firm successful in the first place. This makes it difficult to recreate the same level of urgency from the startup environment. Inability to attract the right talent with an innovative mindset. Oftentimes employees choose to join larger tech companies to avoid the risks associated with startups. This often results in those who are willing to take on more risk to truly build such innovative products self-selecting startups instead of larger tech firms. This thus makes it difficult for them to then attract the type of talent eager to truly drive innovation. 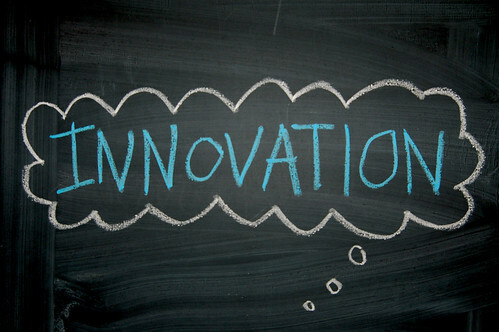 Clearly distinguish innovation projects over core business initiatives. Innovation needs to be managed differently than the core business within a tech firm and it’s important to ensure a clear distinction is made. I’ve seen two models work well for this. The first is creating an entirely separate organization focused on true disruptive innovation, like Google has done with Google X, the birthplace of Google Glass, self-driving cars, and more. At LinkedIn we use an alternative model of classifying initiatives as core/strategic/venture and create separate expectations for venture projects, which embody the truly innovative bets the company is taking. Give innovative projects the room to fail. In startups, failure is a given. For innovation in tech firms to happen, you need to accept failure and enable the team to quickly pivot as things are not working. Experimentation, failing fast, and enabling changing strategy are important to give the team room to solve for what they learn as they embark on product innovation. Such innovative projects don’t fit well into a typical annual planning process at such firms, so it’s important to hold innovation to a different bar. Create decision-making autonomy. To enable these teams to move as quickly as they need to, it’s important to create decision-making autonomy and drive decision-making as far down as possible to the core teams. Similarly it’s important to include as part of this team all the key shared resources that are needed to prevent them from becoming bottle-necked on partner teams that are moving at a different cadence. Allow for distinct team cultures. Such innovation teams need to support a different team culture to succeed, including moving fast, changing strategies frequently, and having a heightened urgency to make things happen. This can’t be the culture of the entire organization, but can be for such teams. And it needs to be accepted and celebrated that certain teams may behave differently. This will help attract the right talent to such teams and ensure they can re-create some of the most important ethos of a startup. While every established tech firm aspires to create an innovation culture, it takes a deliberate set of practices to ensure innovation teams within such firms have the right ingredients to succeed.